Jurassic World is a film about dinosaurs isn’t it? Well yes and no. Like all good films, the subtexts run rather differently to what we actually see on screen. So while we see giant dinosaurs taking chunks out of each other, we’re also witnessing a rather subtle commentary on social relations, and how this is mediated by technology. More specifically, the film reads (for me at least) as a rather stark allegory of the way in which personalised technology (smart phones, wearable tech etc.) is eroding the ways in which we relate to each other as a society. Allow me to explain. And yes, there will be spoilers. Jurassic World is set a number of years after the original Jurassic Park film (it is unclear whether The Lost World and Jurassic Park III had actually happened). The revamped theme park is owned by a billionaire Masrani (who bought the rights for the dinosaurs from Hammond), and run by Claire Dearing. She is the typical career-minded women who has a crumbling relationship with her sister (notified by one cliché-ridden conversation they have) and clearly has relationship issues. Then there is Velociraptor-wrangler Owen Grady, who lives a low-tech life in a converted caravan, fixing his rustic and antiquated motorbike. He has mastered the art of raptor-whispering, and the film establishes early on that he can control these dominant predators. The crux of the film centres upon the fact that the theme park, which has been open for a while, needs new attractions to keep more punters coming, and so they engage in genetic modification of new dinosaurs. Their latest offering is Indominus Rex, a hybrid between a T-Rex and a Velociraptor, with the DNA of a cuttlefish (so it can camouflage), a tree frog (so it can hide from thermal imaging) and it can also see via infrared apparently (borrowed presumably from the DNA of the Predator – which, incidentally, there are a number of nods to in the film). The I-Rex is smart and vicious, and quickly starts running amuck in the park. It becomes apparent though that the animal has been bred covertly as a weapon. The now militarised InGen company seem obsessed with creating dinosaur soldiers. “Imagine if we had these in Tora Bora” is perhaps one of the film’s most ridiculous lines (and there are a few). InGen use the escape of I-Rex as a way of testing their new array of weaponised dinosaurs (the Velociraptors), but of course, this backfires too and most of the military force end up eaten. In the end, it is left up to low-tech-loving Grady, his band of loyal Velociraptors and a good ol’ fashioned T-Rex to take down the I-Rex (although the ultimate demise of the evil creation is rather ignominious). So far, so all about dinosaurs. But sitting through the film, there was a feeling that what I was actually witnessing, was an allegorical deconstruction of not only the rapidly technology-infused ways we communicate, but also our insatiability to consume the latest product innovations (it is hardly a new tale, cinema has been warning us of the danger of technology for decades). The corporate technology giants – Apple, Samsung, Sony, Microsoft, Google and so on; they are the companies that have control of our communication and information-gathering. They mediate the way in which we relate to one other, and the way information disseminates. Wearable tech, augmented reality, heads up displays; technological innovations are mediating the world, and morphing the ways in which we interact with it, and each other. Our eyes are glued to smart phones constantly. They occupy our waking time; they are the first things we look at when we wake up and the last thing before we go to sleep. And even in between, we are dreaming in code. As a society, we’re addicted to personalised technology. And the corporate tech giants of this world are catalysing our addiction by continually ratcheting up the ante with new products (smart watches for example) that have a shorter and shorter lifespan, but all the while engineering an aura of conusmability that sees us blindly order the latest product because we simply must have it, even though we can’t quite explain why. Yet these technologies are changing us as individuals, and as a society. There is a debate about whether tech really is shortening our attention span, but there is little doubt the technological soaking of our societies is making us less patient, more combative, and has replaced the most instinctive desire that we have, that of falling in love. Moreover, these technologies are invading our privacy and in effect sanitising our conditioning to shocks. The culture of ‘meh’ in the face of inequalities and injustice is perhaps the most damaging consequence of personal technologies. 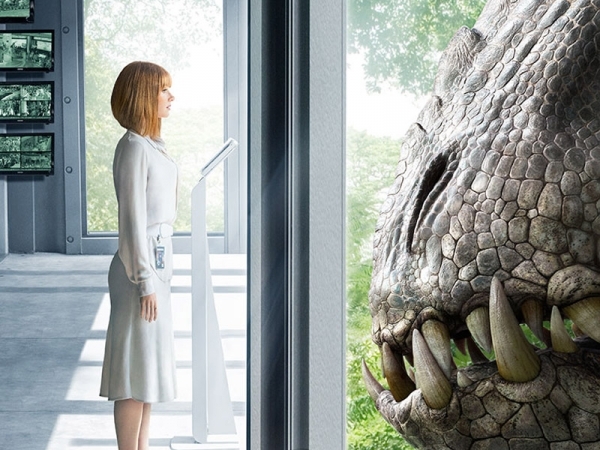 So how does Jurassic World portray all this? For me, the themes began to unravel when we’re introduced to Dr. Wu. He appears very briefly in the original 1993 film, but plays a far more central role in this one. He is the designer-in-chief for the hybridised dinosaurs, and clearly is very proud of his creations. However to me, Dr. Wu’s character had some rather blatant overtones to the late Mr Jobs of Apple (the black turtle neck was really the big giveaway). Dr. Wu says “if we don’t innovate, someone else will”; something that Apple has been saying for sometime, and is classic corporate neoliberal speak. He, along with InGen have been creating technology (dinosaurs) that in one way or another end up hurting us. 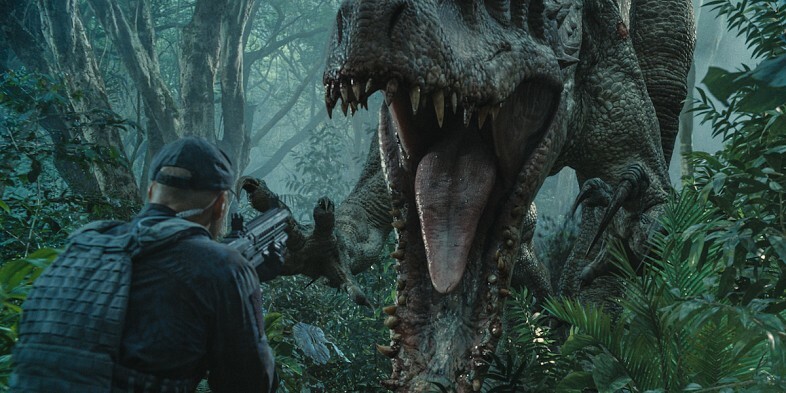 The ‘old’ dinosaurs from the 1993 movie (old tech) are harmless in comparison to the new agile, smart, hybridised, camouflaged and weaponised tech dinosaurs of 2015 and beyond. And just to make the connection between dinosaur and tech blatantly obvious, we see the Raptors donning wearable tech in the third act (in the form of head-mounted cameras). Today the insatiable appetite for consuming the latest gadgetry, fuelled by a rampant commodity-drenched capitalism means that the software giants of the world see ‘innovation’ (or its sister concept, creativity) as the golden goose; and so fuel it whatever-the-costs. In Jurassic World, the desire to create new dinosaurs that have lethal qualities are part of the attraction of the park. One of Dearing’s early statements is “Corporate felt genetic modification would up the ‘wow’ factor”, so more teeth, more terror, more profit. Hence, when it comes to the tech industry, the personal technological products that they are producing at increasing rates, also have these ‘weaponised’ qualities (in that they are attacking societies’ attempts to rebuke them) – they spy on us, deaden our ability to sympathise, mute our apathy and commodify relationships; yet we want more of it all the same. Whether it’s splicing DNA in super-clean genetic labs or coming up with brand new apps in ‘nap pods‘, capitalism’s accumulation-by-dispossession necessitates the need for further innovation, further mediated tech to satisfy increasing consumption, and a thicker atmosphere of spectacle that demands attention that can be bought and sold. The weaponised nature of personal tech (and/or dinosaurs?) is a characteristic that is needed in order to continue our desire for them. In a poignant scene with a dying Apatosaurus, Dearing, who has thus far been in the park’s control room in relative safety (and clearly doesn’t like interacting physically with humans let alone dinosaurs), touches the dying animal as it draws its final breath. We’ve been made aware of her inability to relate on a ‘human level’ in lieu of profiteering for her company, but this scene gives a telling glimpse of how emotional connections are possible through the mist of technological and image-soaked atmospheres that personal technology creates. In the climax to the film, the T-Rex is ‘summoned’ to take on the I-Rex. So the old tech still exists (for example, I think I still have a Nokia 3210 in my drawer – I haven’t used it since 2005, but I think it may have one or two bars of battery left still), and when compared to new tech it can still do the job, but with perhaps less flair (i.e. the T-Rex and I-Rex fight doesn’t really end up with a winner, so we can call it a draw). Also, our hero Grady (who lest we forget lives an old-tech lifestyle) has mastered the raptors/weapons and they ultimately do his bidding. So it seems the film is suggesting that new tech may not be as useful as it is portrayed, but then being useful is not really what it’s about…. Starred to feel very uncomfortable as I read this on my Smartphone! Started to feel very uncomfortable as I read this on my smartphone!